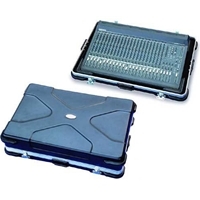 The interior of the SKB SKB-3026 ATA Mixer Safe Universal Case transforms into a snug cradle for virtually any non-rackable mixer up to 30" x 26". Corner cleats securely fasten to the Velcro bed of the case to hold your board firmly in place. SKB builds their products with military-spec, ultrahigh molecular weight polyethylene and premium hardware. All SKB hardshell cases are unconditionally guaranteed forever. That means if you break your SKB ATA Mixer Safe, SKB will repair or replace it at no cost to you.